Robert W. Cone, 59 died on September 18, 2016. General Cone was a native of Manchester, New Hampshire, born in 1957. He graduated from Memorial High School, Manchester, NH in 1975. He graduated from the United States Military Academy with a Bachelor of Science Degree in 1979 and was commissioned as a second lieutenant in the Armor Branch. Cone earned a Master of Arts degree in Sociology from the University of Texas at Austin. His military education includes the Naval War College, the Army Command and General Staff College, the Infantry Officer Advanced Course, and the Armor Officer Basic Course. Cone served in a variety of command, staff, and operational assignments in the United States, Germany, and Southwest Asia. His first duty assignment was with the 2nd Armored Division at Fort Hood, Texas, where he served as a Platoon Leader and Troop Executive Officer in the 2nd Squadron, 1st Cavalry Regiment. In October 1981, Cone became the Aide-de-Camp to the Assistant Division Commander, 2nd Armored Division. He then served as the Battalion Maintenance Officer, Combat Service Support Company Commander, and Tank Company Commander in the 1st Battalion, 67th Armored Regiment (1-67 AR). He attended the Infantry Advanced Course in 1985 followed by graduate school at the University of Texas at Austin. Next, Cone served as an Instructor and Assistant Professor in the Department of Behavioral Sciences and Leadership at the United States Military Academy at West Point, New York. After selection and completion of U.S. Army Command and General Staff College at Fort Leavenworth, Kansas, Cone reported to the 11th Armored Cavalry Regiment (Blackhorse) in Fulda, Germany. He served as the 2nd Squadron Operations Officer (S-3) during Operation Desert Storm, became the Regimental Operations Officer (S-3) in November 1991, then the Regimental Executive Officer in March 1993. He left the 11th Armored Cavalry Regiment in the spring of 1994. 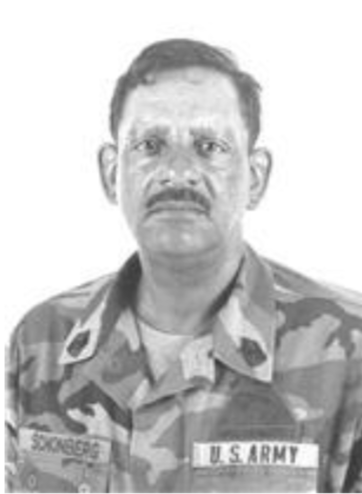 Subsequent to his service in the Blackhorse, he was the Regimental Executive Officer of the 3rd Armored Cavalry Regiment, commander, 1st Squadron, 3rd Armored Cavalry Regiment, and then Special Assistant to the Commanding General, Fort Carson, Colorado, before attending the Naval War College in Newport, Rhode Island in 1997. Following the War College, he was G-3 of the 4th Infantry Division (Mechanized), then commander of 2d Brigade, 4th Infantry Division, where he deployed the brigade to South Korea as part of Exercise Foal Eagle. 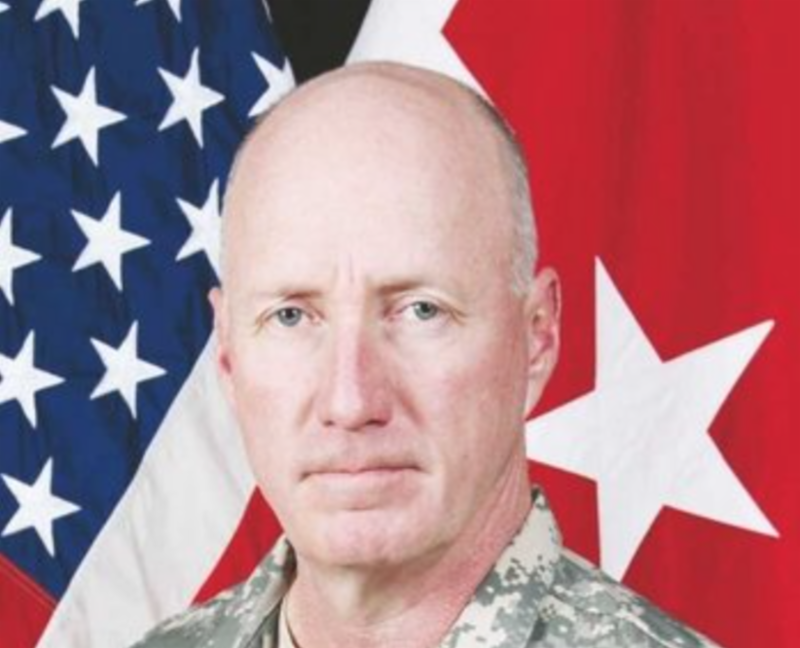 He led his Brigade in the Army’s Division Capstone Exercise in April 2001 as the culminating event in the development of the heavy digital force. Following Brigade Command, Cone was the Director of the Joint Advanced Warfighting Program, Institute for Defense Analyses located in Alexandria, Virginia, where he was responsible for developing joint force concepts and experiments. He participated in Operation Iraqi Freedom in 2003 as the Director of the U.S. Joint Forces Command (JFCOM) Joint Lessons Learned Collection Team, followed by becoming the Director of the JFCOM Joint Center for Operational Analysis in Suffolk, Virginia. In September 2004, Cone became the Commanding General of the National Training Center (NTC) at Fort Irwin, California. He deployed to Afghanistan in June 2007 as part of Operation Enduring Freedom and assumed command of the Combined Security Transition Command – Afghanistan. His 18-month command focused on developing the Afghan National Army and Police. During his tenure, the Afghan National Army expanded from 50,000 troops to close to 80,000 and broad reforms were implemented to address corruption and training in the Afghan National Police. After returning from Afghanistan, he served as the Special Assistant to the Army Chief of Staff then became the Special Assistant to the Commanding General of the Army’s United States Army Training and Doctrine Command where he was responsible for officer and enlisted soldier Initial Entry Training. In September 2009, Cone assumed command of III Corps, during which he deployed III Corps Headquarters to Iraq and became the Deputy Commanding General for Operations – the second highest-ranking military officer in United States Forces – Iraq until February 8, 2011. He had responsibility for operations throughout the entire country including the development and training of fielded Iraqi Security Forces. He oversaw the transition from Operation Iraqi Freedom and counterinsurgency operations to Operation New Dawn and stability operations. His last assignment was as the Commander of the U.S. Army Training and Doctrine Command. Medal with two oak leaf clusters, Army Achievement Medal, Parachutist Badge, Ranger Tab, and the Joint Chiefs of Staff Identification Badge. Lieutenant Colonel (ret.) 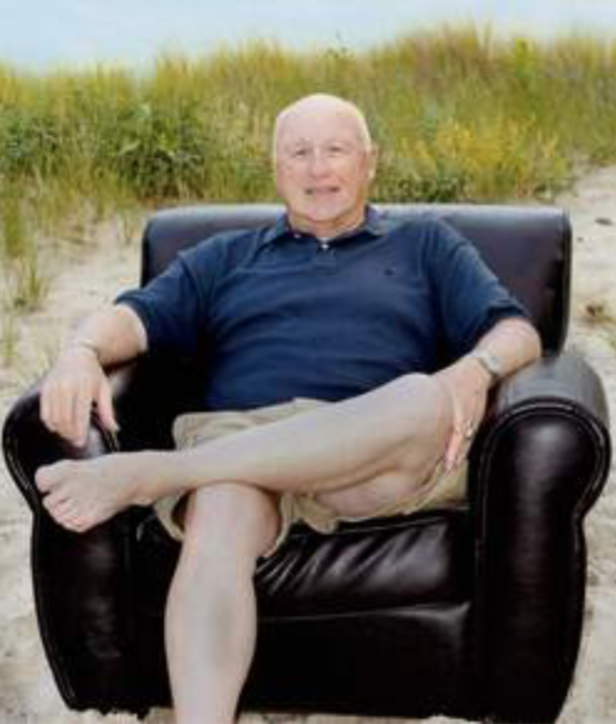 Walter "Bill" Rawls Bowers, age 66, beloved husband, father, grandfather, friend and patron passed away due to complications from IPF on Tuesday, August 9th, 2016. Having been diagnosed with the disease just six months prior, he fought with a stoic sense of drive. Bill is survived by his wife Brenda Burdick Bowers of Yorktown, Virginia; daughter Colleen Bowers Whitney and son-in-law Craig Whitney of Hampton, Virginia; daughter Kathryn Bowers Brown of Chesapeake, Virginia; grandchildren Mikaila Whitney and Austin Whitney of Hampton, Virginia and Gavan Brown of Chesapeake, Virginia; and siblings Nancy "Prissy" Duderstadt of Chicago, Illinois and Judy Bowers of Cincinnati, Ohio; as well as numerous cousins, nieces and nephews across the country. Bill was born August 17, 1949 in Fort Meade, Maryland to Frame John Bowers and Nancy June Rawls. An Army brat, he moved all over, including Canada, and followed his military family before settling in Texas as a high schooler. His love for the Army life would never waiver as he chose to spend 27 years himself as an active duty Army serviceman. After enlisting in the Army to serve a one-year tour with the 1st Cavalry Division in Vietnam where he earned the Purple Heart, Bill returned to Texas where he completed college at Texas A&I (now Texas A&M) University-Kingsville and officer training school. and accommodations. These included the Legion of Merit, Bronze Star Medal, Meritorious Service Medal with 2 oak leaf clusters, Air Medal Ribbon, Army Commendation Medal Ribbon with one oak leaf cluster, Vietnam service Medal with three service stars, Combat Infantryman Badge, and an Aircraft Crewman Badge. Earl graduated from St. Catherine of Sienna High School in Donaldsonville, Louisiana in 1960. Yearning to see the world, he enlisted in the U.S. Army upon graduation from high school. He rose through the ranks to retire with over 30 years of service as a Command Sergeant Major. As part of his military service, Earl had a combat tour of duty in Vietnam and was stationed throughout the world. Earl graduated from several military Non-Commissioned Officers leadership schools to include the U.S. Army Sergeants Major Academy. He concluded his military career in 1991 as the 2nd Armored Division DISCOM Command Sergeant Major in Fort Hood, Texas. Among his many decorations, he was awarded the Legion of Merit, Vietnam Service Medal, Meritorious Service Medal, and the Armed Forces Expeditionary Medal. Earl’s success in the military can be directly attributed to his meticulous work ethic and his love for the uniform. Earl’s attention to details was legendary. He took pride in the fact that soldiers under his command respected one another and were committed to the Army’s values. The discipline and patriotism he learned in the Army never left him, as friends and family will attest. He was a life-long soldier and his passion was passed on to his sons, who are currently serving in the military. He was actively involved in the Catholic Church and the Knights of Columbus. He was a faithful and dedicated member of St. Paul Chong Hasang in Harker Heights, Texas; the Catholic Church was a big part of Earl’s life. He was a quiet philanthropist who faithfully donated to Catholic missions and the less fortunate. Earl leaves behind to cherish in his memory his wife of 48 years, Elsie Schonberg. Other loved ones include sons Earl B. Schonberg Jr, (Bridgette) and Allen B. Schonberg II (Bianca); step-daughters Lincoya Brown, and Haydee "Bunny" Collins; sister Mrs. Eleanor Schonberg Sherman, grandchildren McKenzie Schonberg, Ariel Simone Hill, Johnny Bryan, Tony Bryan, Edward Bryan, and Magnolia Collins; nephew Leo Sherman; niece Marcia Taylor; and a host of other family members and dear friends who will miss him dearly. Sergeant Tyler C. Bertsch entered the military in October 2010 from his hometown of West Fargo, North Dakota. He attended One Station Unit Training at Fort Knox, Kentucky, and he graduated as an M1 Armor crewman 19K10 on March 4, 2011. His assignments include: C Company 1-30 Infantry Battalion as an M1A2 SEP V2 Loader/Gunner and G Trop 2/11 ACR as an M1A1 Gunner/OSV Commander. His military awards include: 2 ARCOM, 1 NDSM, 1 ACM-CS, 1 GWTSM, 1 ASR, 1 OSR, 1 NATOMDL, 3 AAM, 1 NCOPD, 1 AGCM. 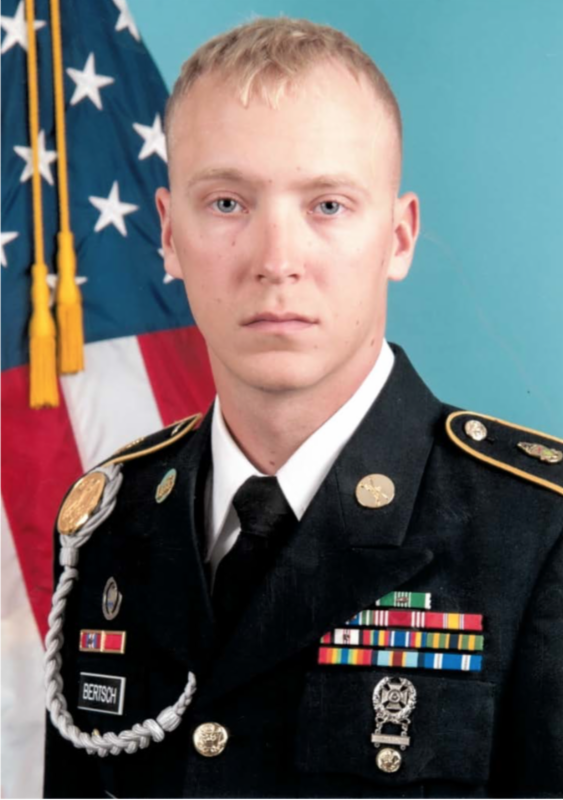 Sergeant Bertsch’s major military accomplishments include achieving the recognition of Battalion Soldier of the Month in March 2013 and Brigade Soldier of the Quarter of April 2013 while at Fort Stewart. He deployed in support of Operation Enduring Freedom from February 2012 to October 2012 in which he drove over 12,000 miles and delivered much-needed supplies to Village Stability Platforms spread out across RC North and RC West. He is an expert with the M9 Pistol. He has loaded for two Abrams gunneries and was a gunner for an additional two gunneries. As a gunner, he shot 901 and 879; all four of the gunneries resulted in first round qualification. Sergeant Bertsch has earned his silver spurs. In December 2014, he earned the recognition as 2/11 ACR Noncommissioned Officer of the Month. His short-term goals are to attend Advanced Leader Course, earn Excellence In Armor, and be promoted to Staff Sergeant. His long-term goals are to retire from the Army as a First Sergeant, become an M1A2 SEP Master Gunner, achieve a bachelor’s degree in mechanical engineering, participate in the Sullivan Cup competition, and become a member of the Sergeant Audie Murphy Club. His hobbies include building models of armored Vehicles from the World War Two era, physical fitness, reading historical novels, watching movies, and traveling. Specialist Holly Jo Mach was born March 31, 1993 in Lincoln, Nebraska. She graduated high school in May 2011 and attended college for a year at Hastings College of Nebraska before joining the Army in March 2012. She attended basic training in Fort Leonard Wood, Missouri and graduated in June 2012. She then attended her Advanced Individual Training at Fort Sill, Oklahoma where she graduated and became a qualified Avenger crewmember in August 2012. Specialist Mach was assigned her first duty station at Camp Casey, Republic of Korea from September 2012 to September 2013. While assigned to Echo Battery, 6th Battalion, 52nd Field Artillery Regiment, she achieved several accomplishments to include February 2013 Soldier of the Month, March 2013 Soldier of the Quarter, May 2013 battalion’s "Best by Test" winner, June 2013 selection by 2nd Infantry Division Commanding General as Warrior of the Week, and August 2013 Soldier of the Month. 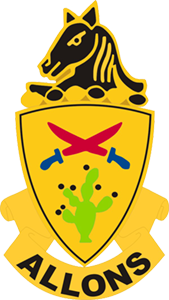 Specialist Mach was assigned to India Battery, 1st Squadron, 11th Armored Cavalry Regiment at Fort Irwin in October 2013. While with India Battery, she became Soldier of the Month in February 2014 before trying out for the Horse Detachment in March 2014, where she is currently assigned. While in the Horse Detachment, she won the April 2014 Soldier of the Month. She received her spurs in May 2014 and attended the Warrior Leader Course in August 2014 when she received various awards to include selection as Student First Sergeant, Commandant’s List, and Distinguished Leadership Award. 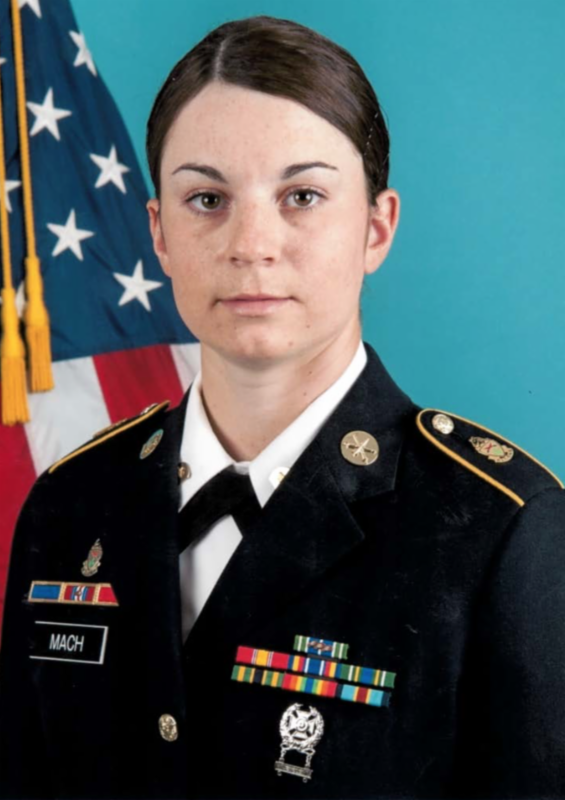 Specialist Mach’s awards and decorations include four AAMs, NDSM, GWOTSM, Korean Defense Service Medal, Army NCO Professional Development Ribbon, ASR, Overseas Ribbon, and Certificate of Achievement. Her near-term goals include becoming the NTC Soldier of the Quarter and reenlisting in the Active Component. Her long-term goals include receiving a bachelor’s degree in psychology and becoming a command sergeant major. We are expanding our corporate membership program. This is a great opportunity for those who have contacts in both small and large companies to help in our fundraising efforts and for the Association to provide recognition to companies that choose to join and support us. The plaques that we are providing are professionally made and will be eye-catching on the wall in an office or lobby. 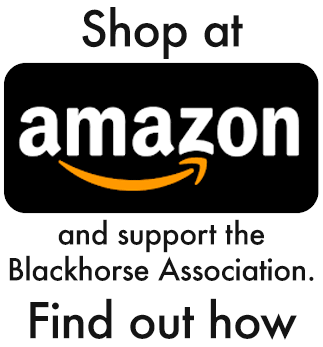 Due to the Blackhorse Association’s 501(c)(3) status, the companies can deduct this membership as a charitable expense. We hope you are as excited about this opportunity as we are and you will not be shy about approaching potential donors. The program is outlined below, and if you have any questions, please contact Dale Skiles at 501-749-8888 or dlskiles@gmail.com. Basic Corporate Membership is $500. Members will receive an 8 x 10 walnut plaque with a brass plate with black matting and brass lettering. Silver Corporate Membership is $1,000. Members will receive a 10.5 x 13 walnut plaque with a silver-colored plate with black matting and silver lettering. Gold Corporate Membership is $3,000. Members will receive a 10.5 x 13 walnut plaque that is laser etched with gold-colored foil embedded in the etching. Platinum Corporate Membership is $5,000. Members will receive a 10.5 x 13 walnut plaque that is laser etched with platinum/silver-colored foil embedded in the etching.